High time to introduce safe guards to monitor investments made by the captive funds and that they can be restricted to investing in the top 20 companies only. Fresh initiatives were under way to hold more road shows this year to promote the Colombo stock market overseas, and to list Govt sovereign bonds and local TB’s on the Exchange, CSE Chairman Ray Abeywardena said, explaining future plans for market expansion. 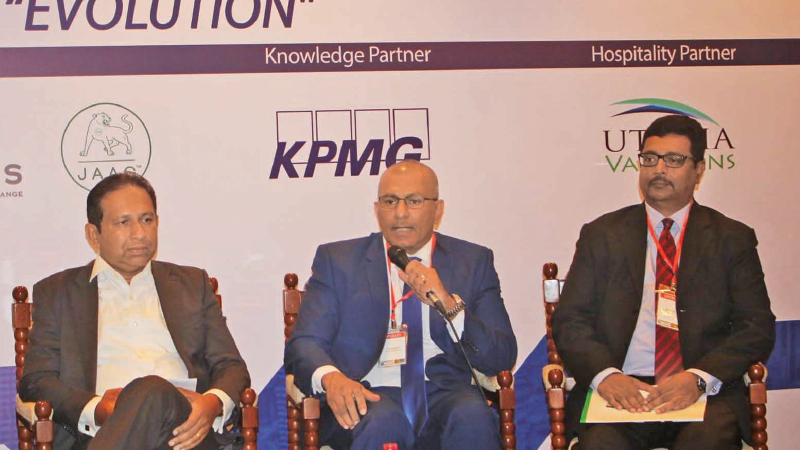 Abeywardena was a panelist at the 7th Annual Capital Market Conference organized by UTO Educonsult (Pvt) Ltd., which was held recently in Colombo. Commenting on excellent valuations and also that the market was comparatively cheap at under nine times on multiples, he stated that the impetus to attract foreign investors would continue. He also spoke of the launch of the Empower Board and the Multi-Currency Board last year, commended the new SEC Chairman and the Commission for the support provided to develop the market. In response to a query as to what the CSE had done to create awareness among the people, Abeywardena stated that around 450 seminars were conducted last year to educate the people on market investment and what to look for when investing in the market. He further stated that the CSE had also initiated seminars for the more discerning investors to help them with valuations and to get a deeper understating of the market. Responding to a question on the plight on the Unit Trust Industry, he agreed that penetration had been poor despite the UT Industry being in existence since the early nineteen nineties. The Tax incentive increased the AUM’ but did not increase the number of UT holders. He was of the view that investors within a Rs. 100,000 or less, should first be directed to invest in UT’s and thereafter be permitted to invest directly in the equity market. Commenting on the debt capital market, Abeywardena stated that discussions are underway to list both the Government Sovereign Bonds and the Local TB’s on the Exchange, which would definitely create more awareness to the market. Abeywardena further stated that regardless of what Government is in power, policies and directives of the regulators must not change. Commenting further, he explained that it is the current Chairman of the SEC who is extremely keen to see the market being developed and is in constant touch with him and the CSE with a view to assisting the CSE to introduce new products and services to the market. When questioned as to what his expectations for the market was, he responded that he had a bucket full of ‘wish lists’ but if he were to prioritize the need, it would be getting the captive funds back into the market. Abeywardena stated that even in a recent interview, he had stated that it was a ‘miracle’ that the market had survived the last 4 years without a single local captive fund investing in the market, despite assurances from those in power that the EPF would be permitted to get back to the market. Abeywardena was of the view that it was high time that safe guards were put in place to monitor investments made by the captive funds and that they could be restricted to investing in the top 20 companies only. Responding to a query on why the captive funds were being kept away after the ‘pump & dump’ accusations were made, he said that persons responsible must be brought to book to ensure that others are not penalized for past wrong doings. Whilst foreign investors continue to be prudent in their stock selection and continue to make investments, the locals funds are unable to seize the opportunity, he lamented.